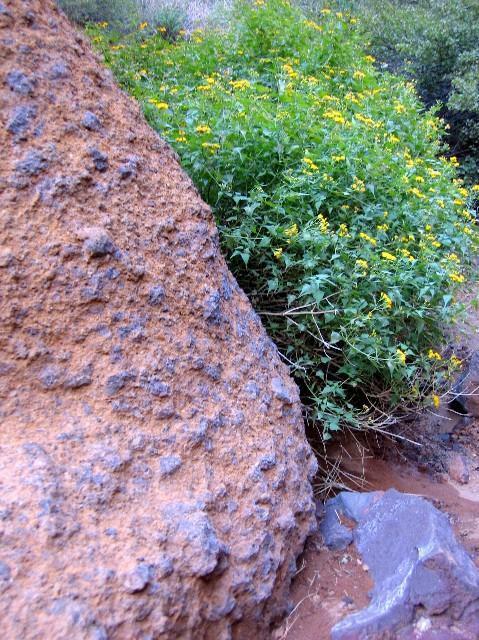 Into the heart of a 740,000 year old volcano....a fascinating look at the geology of AZ. 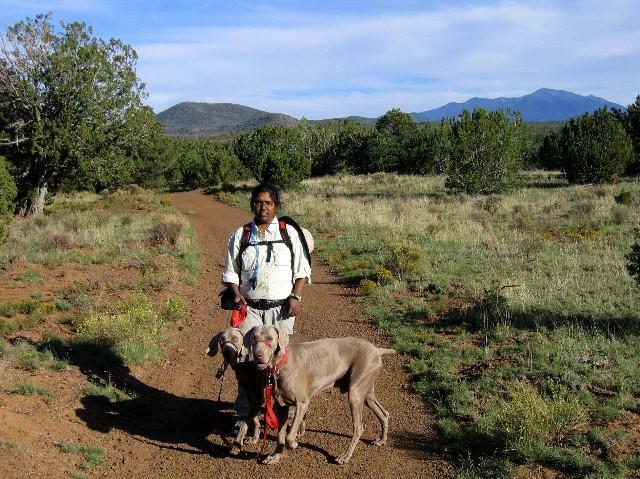 This is quite an easy hike/walk in the Flagstaff area. Its has been one that I have often wanted to stop by on my many trips back and forth from the Grand Canyon but never quite did until now....The trailhead is at Milepost 247 along Highway 180 -- well signed. Turn left oonto this good dirt road that will end at developed trailhead a short distance from the turnoff. There is a parking area right at the turnoff but proceed further to the developed trailhead. 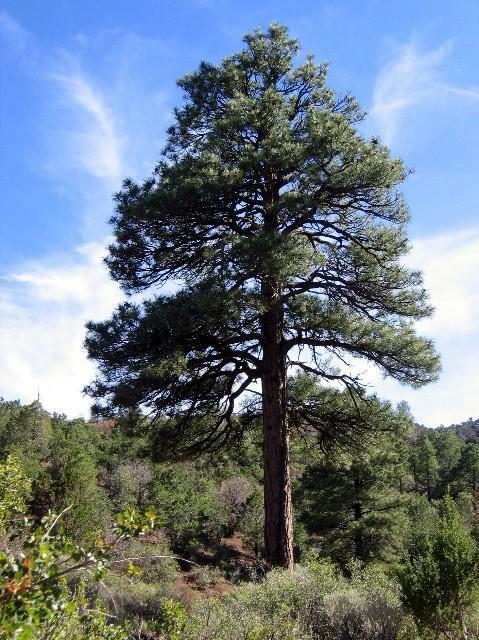 The trail is a fairly easy meander for about 1.25 miles through pinyon and junipers. 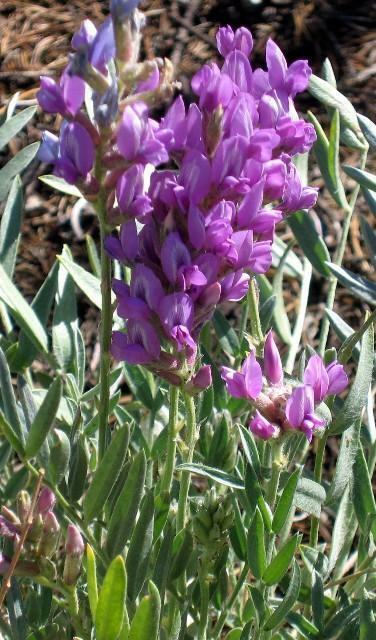 The trail is a constant rise but the distance goes by quick -- you are drawn in by the sheared off cliff face with its hoodoos and the path is dotted with a variety of blooms - yellow, orange, pink and red against the red cinders or green pinyons. 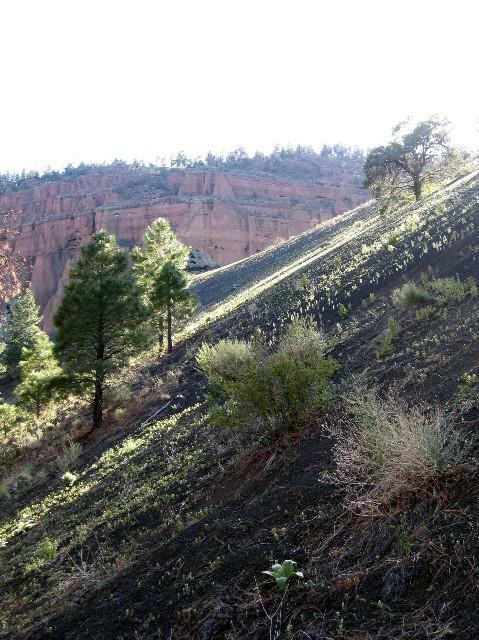 At about 3/4 mile; the trail drops into a wash and follows it in towards the sheared cliff face. 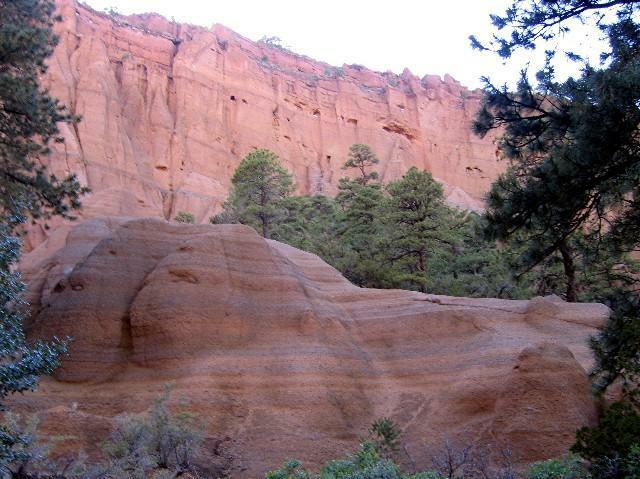 The wash is firm sand with scattered ponderosa pines; narrowing down as you head closer and closer to the mountain. 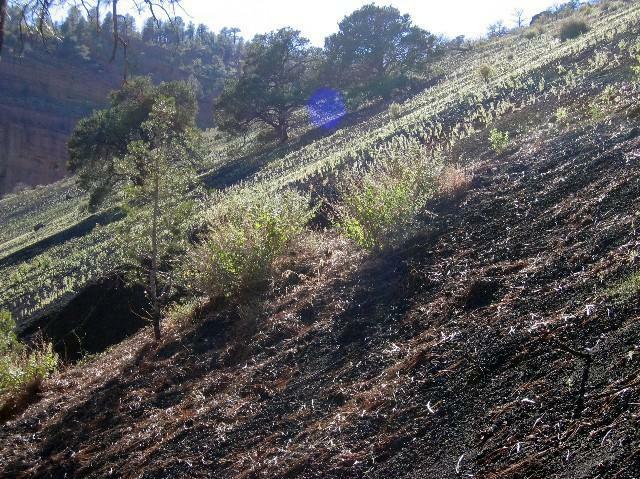 You are now flanked by black cinder slopes dotted by interesting vegetation. As I was hiking in late in he afternoon the vegetation was catching the last rays as the sun sank over the cliff and were adding a slivery glimmer to the black slopes - an eerie glow. 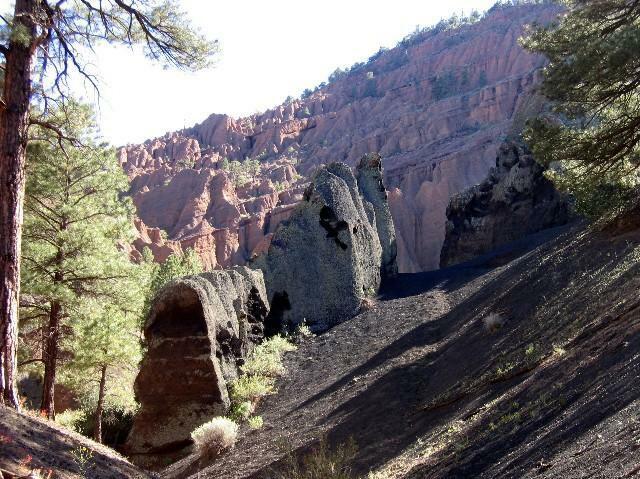 You come upon some black lava formations that act like a gate to the place. You will soon reach a 6 ft high silted up check dam over which a ladder has been built to allow access to the inner area. The optional route is a scramble up the cinder shoulder to the right and between the "gates" and down the other side. If you are hiking with dogs; this is your route. Once you reach the top you will have to navigate a short section of exposure and somewhat slipper footing to gain access to the area where you can descend to the inner areas. 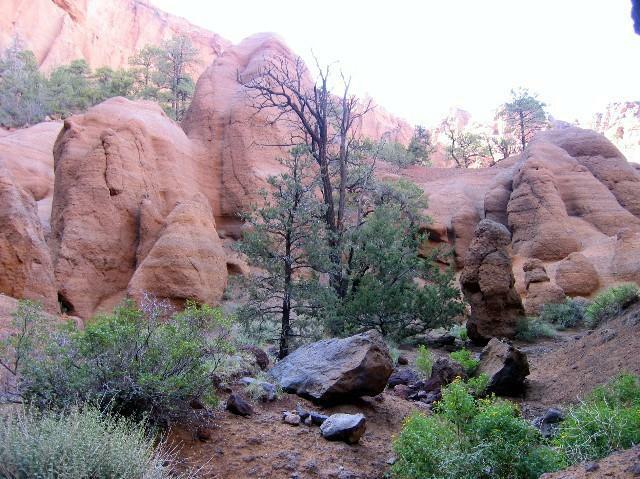 Once inside the trail heads a short ways in and then you are off exploring among the spires, pillars and pinnacles. The predominant color is earthy reds punctuated by mustard and black. This is the heart of a million year old volcano and the volcanic tuff has been sculpted into variety of shapes. You can follow any number of avenues to explore the area. 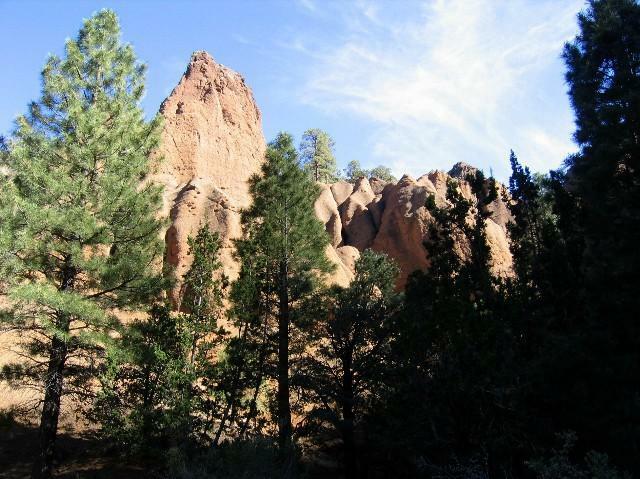 The area has re-vegetated and you will find pondererosa pines growing out of the tuff. I chose to follow the stream bed back into the curving tuff formations following a trail of a variety of bushes and flowering plants supported by the stream. Interesting formations were at every bend and the rocks were beautifully sculpted.... Looking up at the horizon you could see the spires extend all the way up to the ponderosa clad ridgeline. There were birds nesting in hollows along the sheer wall -- marked by splotches of white bird droppings were their favored perches. 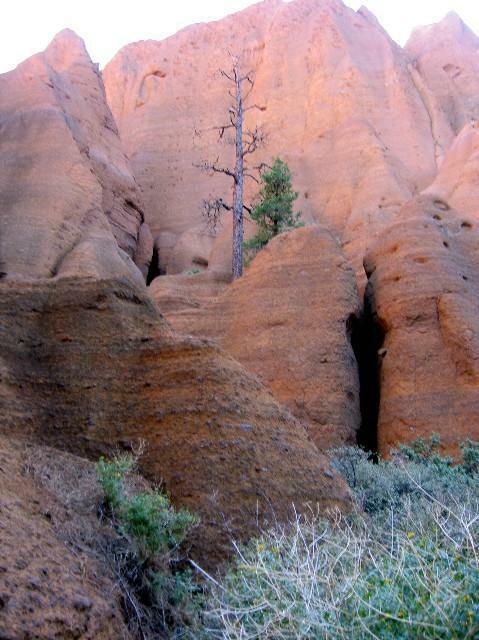 Light plays hide and seek among the spires and hoodoos and so can you. Be watchful as you scramble up these formations -- most are a lot easier going up than down! After a bit of exploring; we returned by way of the cinder hill exit and were quickly back to the trail head. 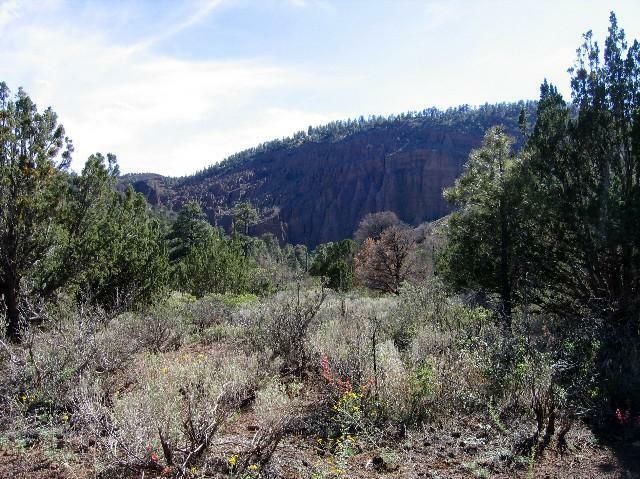 On the return trip you are treated to some expansive vistas of the Flagstaff mountains. Note: Water is not available along this trail. Take I-17 North into Flagstaff, then follow Hwy 180 North for about 26 miles. (Follow the signs for the Grand Canyon). You will see a sign for Red Mountain and a dirt road leading off to the west. Follow this a short distance (about a mile) until it ends at a parking area. A sign there marks the start of the trail. 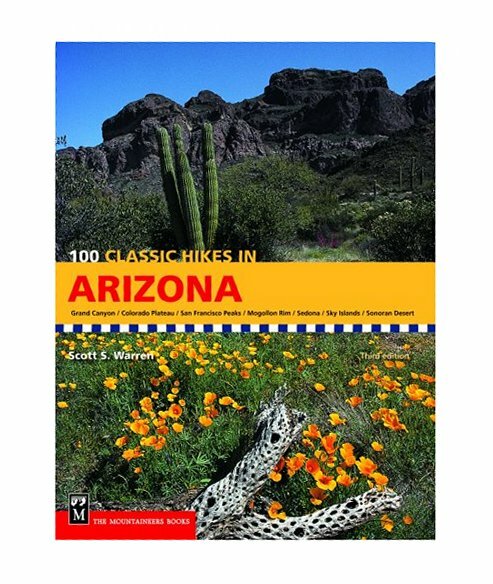 Author writes: Drive North along Highway 180 to MP 247. You will see a sign for Red Mountain. Turn left onto FR follow good dirt road to trail head.